Tennessee Gov. 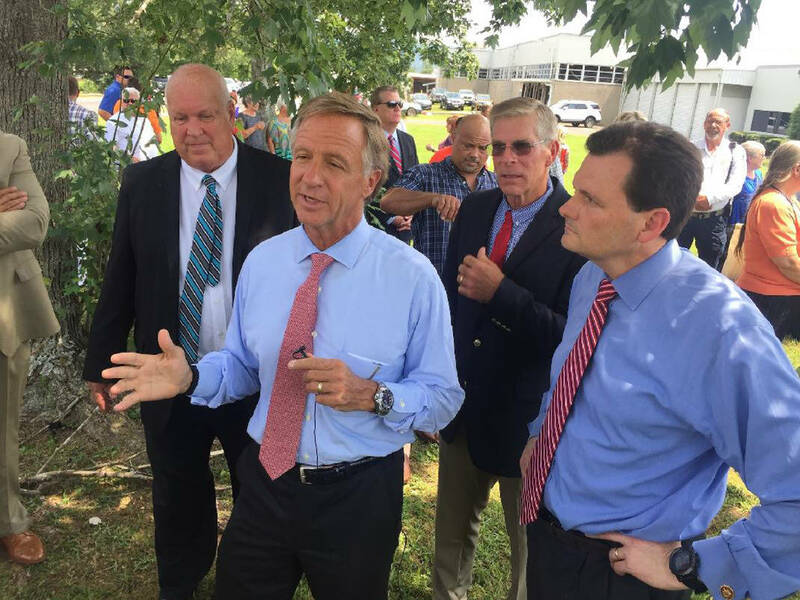 Bill Haslam, center, talks in July 2017 about the $27.1 million investment a new textile company plannned in Pikeville to create 1,000 jobs. With Haslam, from left, are Pikeville Mayor Philip "Winky" Cagle, Bledsoe County Mayor Gregg Ridley and Troy King, chief legal counsel for Textile Corporation of America. Photo by Contributed Photo /Times Free Press. PIKEVILLE, Tenn. — In July 2017, Tennessee Gov. Bill Haslam traveled here to announce what officials claimed would be the biggest new investment ever in Bledsoe County history — a new American textile company that promised to bring 1,000 jobs to one of the most economically challenged counties in Tennessee. "We believe this represents the renaissance of America, the return of America as a global manufacturing center," Troy King, a former attorney general in Alabama and chief counsel for the new textile manufacturer, said at the time. "It's a very ambitious and aggressive timeline, but we're ready to go to work and ready to put people to work." But a year later — even after getting $3 million in state aid — only 26 workers have been employed by the textile company, only a handful in Bledsoe County. And the company making the big promises of an American textile comeback, Textile Corp. of America, is yet to produce any goods and its plant is yet to install any sewing or stitching equipment. The owners of TCA are now fighting in court over who is in control of the company and how the money they have raised so far has been spent. TCA and a related business, Master Group USA, are suing one of the company founders and their lender, accusing them of fraud and breach of contract. While TCA owners aren't speaking to one another, except in ongoing court cases, a lender is trying to foreclose on TCA's mill, which could bring an end to the Pikeville project. Much of the money that has been put in the business so far has been borrowed at premium rates for high-risk loans and $29,164 in property taxes due on the Pikeville plant last year have yet to be paid, according to testimony last week during a Chancery Court hearing in Dunlap, Tennessee. The biggest investment in the project so far appears to have come from taxpayers through a Fast Track grant from the state Department of Economic and Community Development. "Somebody got $3 million from the state of Tennessee, and where that money has gone? I don't know," Dunlap attorney Tommy Austin said during a court hearing over the proposed foreclosure action Wednesday. But at the same hearing, TCA manager Karim Sadruddin said the company soon plans to begin hiring workers for the Pikeville mill and should have 300 or more employees by the end of the year. Sadruddin said he is "absolutely" sure the company will reach its 1,000-employee target within five years. "We had unfortunate and unforeseen issues, but we are committed to the plant and people of Pikeville," Sadruddin said. TCA plans to make towels, bed linens and boxers at the new plant, products the company will wholesale to major apparel retailers and sell to institutions such as jails and hospitals. Sadruddin testified last week that machinery has been ordered to begin production in the former automotive supply plant in Pikeville, which TCA bought last year and has been renovated and used since as a distribution facility for another related textile firm. Sadruddin and his brother, Rahim, who claim to own nearly two-thirds of TCA, say they have invested $500,000 of their own money in the venture so far. As fourth-generation textile managers who trace their roots to mill owners in Pakistan, the Sadruddin brothers say they have the business ties and expertise to succeed. They chose the former Dura Automotive plant in Pikeville, where 580 employees once worked before Dura shut down in 2005, because the rural county has above-average unemployment and qualifies for extra state assistance as a distressed county. Bledsoe County Executive Gregg Ridley said he was "very disappointed by the delays and the accusations that have gone back and forth" by TCA. The county and its Industrial Development Board had worked for years to recruit a new business into the Dura plant. But Ridley said no property tax breaks were awarded to TCA to land the project. "I'm very hopeful this is still going to happen because Pikeville and Bledsoe County needs these jobs," Ridley said. "And that (former Dura plant) was our only asset to market to get this many jobs into county and it's not under the county's control anymore." The Tennessee Department of Economic and Community Development authorized the grant money to be dispersed to TCA last October. To secure the state assistance last year, the TCA owners pledged to put $27.1 million of outside capital into the project. But in court filings, the business owners acknowledge that they had trouble coming up with the $850,000 to buy the factory or other capital to acquire inventory and machinery. To both finance the building purchase and later to raise funds for another textile venture, the owners turned to private individuals to secure short-term loans and paid premium interest and fee payments to get their money. Last fall, TCA told local authorities who oversee the state grant that the company had paid more than $3 million to buy and renovate the 186,000-square-foot plant on Ferro Road in Pikeville. But Sadruddin testified in court last week that his associates in Atlanta prepared an invoice for work that was done by another part owner of TCA, Chattanooga builder Ed Cagle, even though Cagle and his attorney dispute the validity of the invoice. Jerry Farinash, an attorney for Cagle, questioned Sadruddin about what he called "a falsified" copy of a wire transfer that said a payment was made last September when it had not actually been paid. A copy of that wire transfer was used to secure payment of the state grant to TCA, Farinash said. "That was a lie, wasn't it?" Farinash asked Sadruddin. The TCA manager disputed Farinash's assertion, claiming he was simply documenting the work claims from Cagle. But Cagle, a Chattanooga businessman who has made a fortune building Family Dollar stores and other real estate projects, says he was paid only $850,000 for the renovation of the Pikeville factory, which he said is ready for production if and when the textile machinery is installed. Sadruddin said Cagle was paid more than $2 million and more work was still needed to ready the Pikeville factory for manufacturing to begin. The Sadruddin brothers teamed up with Cagle, former Alabama Attorney General King and business consultant Don Fletcher last year to create TCA to redevelop the former Dura plant for a new U.S.-based textile manufacturer. The ownership among the four owners — and who has the authority to borrow money and mortgage property — is in dispute in lawsuits pending in both Bledsoe and Sequatchie County courts. Sadruddin claims it was Cagle who misrepresented his authority in the company and his ability to secure money and complete the project. In May, Sadruddin and the companies he says he controls — TCA and Master Group USA — filed a 50-page lawsuit in Bledsoe County Chancery Court accusing Cagle of fraud and misuse of the business funds. "Despite having expended at least more than the original budgeted costs and despite having ample time to complete the necessary construction and remodeling work, construction and remodeling of the Pikeville plant was never properly completed," Chattanooga attorney James McKoon said in the lawsuit against Cagle. The lawsuit says Cagle owns only 25 percent of the company and Karim Sadruddin is the manager of TCA as agreed to by the parties after the ribbon cutting for the new textile mill last July. But Cagle said an earlier operating agreement for TCA, which he claims is still in place, divides the ownership of TCA equally between Karim Sadruddin and Cagle. To finance the purchase of the shuttered Dura plant last July, Cagle turned to his brother, Charles, to provide a loan to buy the factory. Charles Cagle was paid a $100,000 premium to put up the $850,000 to buy the factory and relied upon his brother having equal ownership and the authority to negotiate the loan. Later, the factory was used for collateral for another $1.4 million loan provided to another company owned by the Sadruddins, Master Group USA, to allow that company to make and supply tarps for the Federal Emergency Management Agency (FEMA) as part of that agency's relief for Puerto Rico after last year's hurricanes. Master Group signed a contract with FEMA worth up to $31.7 million to provide tarps for Puerto Rico relief efforts, and proceeds from the FEMA contract were supposed to repay the $1.4 million loan. But FEMA reportedly suspended payments to Master Group over concerns that the tarps were not made in the United States as the contract required, and the loan has yet to be repaid. The lender for the tarp money, Whoriskey Inc., has filed a foreclosure action against the Pikeville plant, which Cagle put up as security for repayment of the loan to the Master Group for the tarps. Sadruddin's attorneys claim there was never a proper deed of trust to use the Pikeville mill as security. The legal case is pending in Sequatchie County Circuit Court, and Judge J. Curtis Smith has scheduled an Aug. 27 hearing to decide whether the foreclosure action is legal and can proceed or not. For now, the Pikeville building is being used to store inventory of hospital linens and more than 80,000 tarps, which Austin claimed were made in China. Sadruddin denies the tarps are Chinese made. Sadruddin's attorneys also question how Cagle handled getting the $1.4 million loan for the tarp project. In court testimony last week, Cagle said he worked with a private lending business, Whoriskey Inc., which said it would charge a $100,000 fee to lend $1.4 million for the tarps and also would need the Pikeville mill as collateral for the loan. Cagle said he discussed the necessity of getting the loan money for the tarp project to proceed and claims Sadruddin said he would pay $500,000 to get the money. The $1.4 million loan, as structured, gave only $800,000 to Master Group for the tarps. Whoriskey was paid a $100,000 fee and Cagle, who helped arrange the financing, used another $500,000 to pay debt on his Highway 58 office and to make a payment to Champagne Air LLC, a private aircraft service Cagle owns with his wife, Tammye. But McKoon said Cagle had no authority to mortgage the Pikeville mill without approval by other TCA owners. "Cagle had no authority from either TCA or Master Group to enter into any agreements with Whoriskey Inc. on behalf of TCA or Master Group," McKoon said in a motion to dismiss the foreclosure action by Whoriskey on the Pikeville mill. In a separate civil action against Cagle filed in Bledsoe County Chancery Court, McKoon also claims Cagle overcharged for work at the Pikeville plant, misrepresented his ownership share and control of TCA and improperly spent money to buy a nearby trailer park in Pikeville under his wife's name. But Cagle denies any wrongdoing. "I have not profited from this business," he said. "But I am still eager to do what I can to try to bring more jobs to Pikeville to use this plant now that it has been refurbished."